Science Project _ Do green plants need light to produce starch? Glucose, starch and cellulose are some of the carbohydrates produced by plants. In fact both the starch and cellulose are the polymers of glucose. Starches are carbohydrates in which 300 to 1000 glucose units join together. 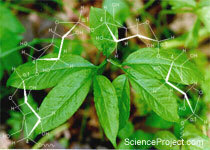 Cellulose molecules are polymers of about 1500 glucose units. Grains, barley, rice, corn and potato are among the high starch plant products humans and animals consume as food. Where is the starch made and do plants need light to produce starch? In this project you will study to see if starch is being produced in the leaves and if light is necessary for the production of starch. You will use a house plant for your experiment. You will need access to the sunlight or you must use artificial light for your experiment. You will need about two weeks to complete your experiments. More details or support for this project is available for the members of ScienceProject.com web site. Materials needed for experiment such as the starch test indicator may be purchased from MiniScience.com.